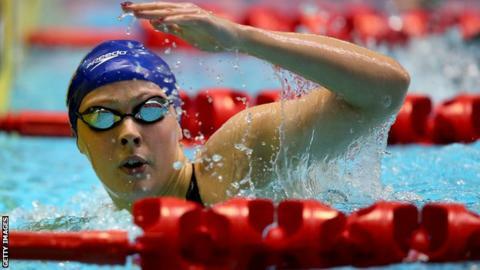 England's Siobhan-Marie O'Connor won her second gold at the 2014 British Championships with an English record in the 200m individual medley final. O'Connor, 18, who claimed 200m freestyle victory on Saturday, touched in two minutes 9.71 seconds to head off Aimee Willmott and Sophie Allen. Six-time British Champion Hannah Miley finished fourth. "I think I can still go quicker," said O'Connor, who was Team GB's youngest swimmer at London 2012 Olympics. "I'm really happy to win and get the record, but I went out too quickly and was really struggling in the final few metres. Once I get that sorted I'll be in a good place." The British Championships at Tollcross, Glasgow are doubling up as the final opportunity for swimmers to secure Commonwealth Games berths for England, Scotland and Wales. Francesca Halsall (50m butterfly) and Adam Brown (100m) freestyle defended their titles, while Chris Walker-Hebborn and Lauren Quigley won their respective 50m and 200m backstroke finals. Six-time Paralympic medallist Claire Cashmore won her SB9 100m breastroke race, but her time of one minute 22.31 was just outside of the required mark. Halsall, who is the defending Commonwealth champion over 50m butterfly, continued her impressive meet with a second gold and a fastest qualification time for Monday's 100m freestyle final. England's Walker-Hebborn defeated two-time world champion Liam Tancock for the second time at the 2014 GB Championships. He finished the 50m backstroke event in a personal best of 25.09 secs, with world record holder Tancock second in 25.38. "I'm enjoying this battle with Liam and it's great to come out on top again. Hopefully I can keep lowering my times closer to the records he's set," Walker-Hebborn said. Tancock added; "I've had injury problems and they took a while to get diagnosed and fixed but I'm not making excuses, I've had a dip but can come back strong again." US-based Brown, 25, won the men's blue-ribbon 100m freestyle final for the second year in a row. His time of 49.35 secs was outside the English Commonwealth qualification mark, but he could yet earn a spot in the individual event after securing a place in the relay. Sophie Taylor, 18, who has already won the 50m and 200m breaststroke titles, continued her impressive form by qualifying quickest for Monday's 100m final. Scotland's 100m breaststroke champion Ross Murdoch achieved the same feat in the 50m, whilst compatriot Andrew McGovern secured his place in Glasgow by finishing fifth in 25.91 secs in the 50m backstroke event. Welsh record holder Jazz Carlin, 23, who won three British titles last year is well-placed for a defence of her 800m freestyle crown, having qualified fastest in eight minutes 29.77 secs ahead of Monday night's final.